The Green Algae, Chlorella sp. (Division Chlorophyta, Order Chlorellales. Family Chlorellaceae). This photo is found at a number of places online, e.g. 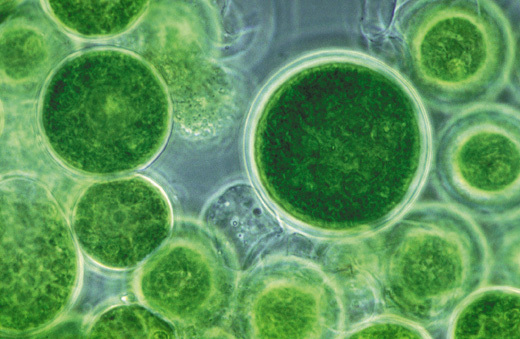 Integrated Algae Production in Built Environments, Algae Research, HFood: Chlorella, This hardy freshwater organism has a number of uses (food, medicinal, wastewater treatment, biofuel, etc). The above shows the second of a series of three integrative diagrams on Cosmic evolution by Erich Jantsch. In his book The Self Organizing Universe, Jantsch, an astronomer and futurist influenced by systems theorist Illya Prigogine, unifies the various fields of science and human knowledge in a single evolutionary framework. 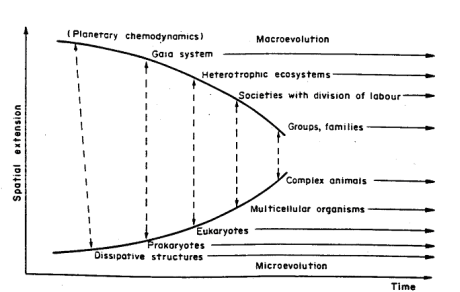 The above diagram, entitled "Socio-biological evolution", continues the same events and processes shown in the previous diagram. As the name indicates, evolution is here not only about life but about communities of organisms and social behaviour. Here, following the development of the Earth, life appears and evolves through feedback between the micro- and macro- scales. On the macro- or more properly collective scale, there is the evolution of the prebiotic Earth (macro) and dissipative structures (micro) into planetary biosphere (Gaia - macro) and prokaryote organisms (micro). The evolution of eukaryotes makes possible diversified ecosystems, while multicellular organisms and more complex nervous systems and intelligence levels enable intraspecific societies and group and family behaviour (ethology, sociobiology). MAK110907. (diagram copyright, Erich Jantsch, Pergamon Press). Taxonomy Although the philosopher Aristotle organised the animal kingdom in a linear scale according to a "natural ladder", and so, in a sense, was the first biologist, it wasn't until the 18th century, the Swedish botanist Carl von Linné, an heir to the age of enlightenment, developed a method of classifying the natural world in a formal manner, called binomial nomenclature. This enabled every species, living or extinct, to be be scientifically identified, described, and placed in a category with similar organisms. Without being able to formally identify, name, and reference species in this way, biology would not be possible. Almost two and a half centuries later, Linnaeus (the Latinised version of his name under which he is better known)'s taxonomic system is still an essential part of biology. Paleontology : Although since classical times travellers and philosophers would observe shells in rocks at the sides of mountains, or discover the skeletons of prehistoric elephants or dinosaurs and believe them to the the remains of fabulous mythical creatures, Paleontology, as a science of the study of ancient life via fossil remains, only dates back to end of the 18th century. Fossil shells and plants were thought of as curiosities formed under the Earth by inorganic means, perhaps representing the way in which the "great chain of being" bridged the mineral and plant and animal kingdoms. 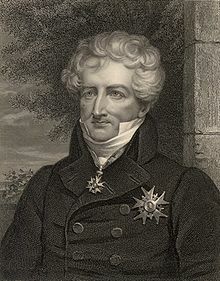 Natural philosophers of the time had difficulty making sense of the growing number fossil bones uncovered in mines and quarries until the great French naturalist Georges Cuvier showed that they were the petrified remains of animals anatomically similar to those found today, but different enough to belong to different genera and families of organisms. Fossils could thus be understood and explained biologically, rather than as miraculous curiosities. As evolution was not yet understood, Cuvier explained the succession of life in terms of repeated local extinctions, with new species migrating to fill the gaps. He was thus the first person to show that species once alive could become extinct. Up until that time this was thought impossible, because it would create a gap in the God's perfect creation, the Great Chain of Being. Cuvier never explained where species came from in the first place, as he considered this beyond the capacity of science (he was totally opposed to the proto-evolutionary theory of Lamarck). Catastrophism, the idea of repeated global catastrophes, after which God repopulated the world with different species, is often wrongly attributed to Cuvier, and belongs to later scientists such as Alcide d'Orbigny in France and William Buckland in England. Even with the many scientific discoveries made since, uncovering and understanding the fossil record remains an essential part of mapping the history of life on Earth. Evolution: In the mid 19th century Charles Darwin established a naturalistic theory of evolution, one that still serves as the foundation for evolutionary biology today. Although scientists had already aquired a concept of geological processes over vast eras of time, and Cuvier, Owen, and other naturalists had identified fossils and even named many kinds of prehistoric organisms, and that species could become extinct, the idea that life itself could change was still new, although gaining in popularity, tied in with the general idea of social progress and spiritual themes of the temporalisation of the Great Chain of Being. What was radicallyt new however was to explain evolutrion in pureely naturalistic terms, Darwin being only the second scientist to do so, after Lamarck. It is hard for us in the modern world to imagine the importance of Darwin's discovery, and his introduction of dynamism and progressive change in a literalist biblical theistic or deistic worldview. Without evolution, there would only be a stifling sameness, no rise and fall of vendobionts, anomolocarids, trilobites, sea scorpions, weird armoured paleozoic fish, primordial coal swamps, dinosaurs, and all the other incredible denizens and ecosystems that have populated and shared our planet through the ages. About the most we could hope for in a static universe would be dinosaurs on Noah's Ark. Nor would we have an idea of where we are going (which may or may not be an optimistic one, depending on your perspective). Phylogeny and Systematics. If paleontology reveals the remains of organisms from past ages, and evolution shows that these various species came about through natural rather than supernatural processes, Phylogeny is the piecing together of the family tree of life on Earth, tracing the path which evolution took. Phylogeny was developed by the german scientist, illustrator, and evolutionary populariser Ernst Haeckel in the second half of the 19th century. Nevertheless it was not till the mid 20th century that ornithologist and biological systematist Ernst Mayr, vertebrate paleontologist George Gaylord Simpson, and evolutionary biologist Arthur James Cain developed evolutionary systematics, seamlessly integrating the taxonomic system of Linnaeus with the evolutionary "Modern Synthesis" science of Darwin and Mendel to create the new science of Systematic Biology, which is concerned with the classification of life according to its phylogeny (its evolutionary history). Palaeontologist Alfred Sherwood Romer, popularised phylogenetic trees that were incorporated into evolutionary systematics. Several decades later, the German entomologist Willi Hennig developed the second great phylogenetic science, Cladistics, as a means of empirically testing phylogenetic hypotheses, although it would not be until the 1980s that his ideas were accepted in the English-speaking world, where they had a revolutionary impact, especially in vertebrate paleontology, thanks to the work of Jacques Gauthier and others. Cladistic hypotheses are graphically represented in the form of a type of phylogenetic tree called a cladogram, which is totally distinct from Romer's trees. During the 1960s, the biochemist Walter M. Fitch developed molecular phylogeny, by which the evolutionary history of a group can be traced through studying molecular sequences (proteins, RNA, and DNA). As with cladistics, the statistical results can be represented in the form of a branching tree. In the 1970s and 80s Carl Woese expanded this methodology to study the family tree of all life on Earth, discovering the three great domains of life. Modern phylogenetics is mostly a synthesis of cladistics and molecular phylogeny. Especially in vertebrate paleontology, paleoherpetology, and dinosaurology, the Linnaean system has been challenged by the new cladistic system of phylogenetic nomenclature. Nevertheless the utility and robustness of the Linnaean scheme make its abandonment unlikely any time soon. Both classification schemes use a system of nested hierarchies to show how organisms are related, and only recognise "natural" groups (groups that share a common ancestor). As with geneology diagrams that map the ancestry of a human family, phylogenetic diagrams that trace the origin, descent, and evolutionary relationships of groups of organisms, or even of all life on earth, are presented in terms of tree-like diagrams, called dendrograms or cladograms which together map out the family relationship of all of life on Earth, putting it all together in one big evolutionary tree. Along with the geological timescale, phylogeny constitutes the central focus of Palaeos. Ecology : Just a holding page at the moment. Astrobiology : Of course life is certainly not limited to this planet alone, hence we have a page on the very speculative but also very cool science of astrobiology. Life on Earth : Here is our basic introduction to Life on Earth; which we have informally christened "Tellurobiota". This unit covers such topics as the Meaning of Life, the Facts of Life, and the Purpose of Life, Kingdoms of Life, and the Tree of Life and serves as a springboard to more detailed consideration of the phylogeny (evolutionary tree) of Life on Earth.